In Year One the children explore 'Geographical Enquiry', 'Physical Geography', 'Human Geography' and 'Geographical Knowledge'. The children will talk about what they like about where they live. They will sort things that they like and don't like. The will be encouraged to answer questions using a range of resources. The children will think of questions they can ask about where they live. They will also explore the weather and be encouraged to keep a weather chart. The children will be ecnouraged to learn their address and where they live. They will explore hot and cold places and their features. They will describe a locality using words and pictures. The children will talk about how the weather chnages with each season. They will name features of a town or village. The children will explore clothing that they wear at different times of the year and begin to explain why we have to wear these different clothes. They will be encouraged to talk about people who live in hot and cold places. They will also talk about the clothes they migth wear if they live in a very hot or very cold place. The children will explore the United Kingdom. They will identify the four countries that make up the U.K. They will explore some of the main towns and cities in the U.K. They will also explore a globe or atlas and identify where the Equator, North Pole and South Pole are. 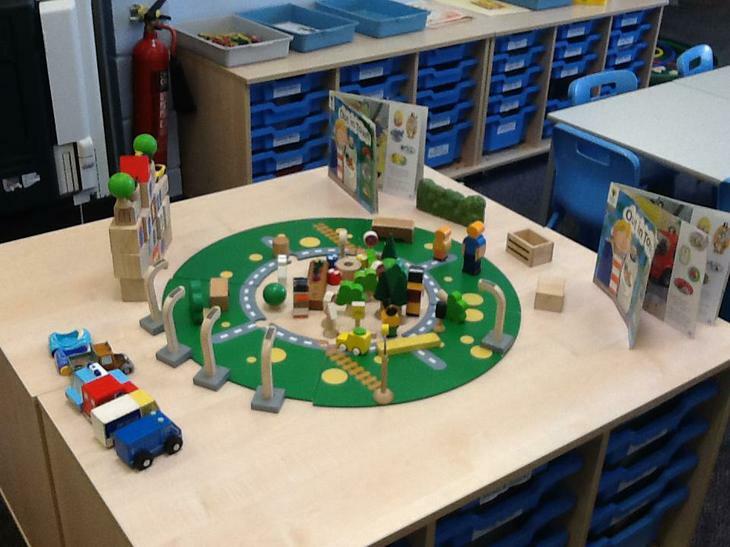 The children have been exploring 'Our Town' in the minature world. The BBC Bitesize website is a good website for your children to explore and learn more about Geography.